Situated in Calas de Mallorca, Globales Samoa Hotel is nestled near the stunning beach of Cala Domingos and the resort of Calas de Mallorca. The 3-star hotel is just 2-3 minutes from the beach, and the rooms offer beautiful views of the sea. The spacious and comfortable rooms feature all the essential amenities and the family rooms offer bunk beds for children. Guests can choose from a variety of delicious dishes in the main restaurant and enjoy refreshing drinks from any of the 3 bars in the Globales Samoa Hotel Majorca. There are outdoor swimming pools for adults and children. Kids also get to enjoy at their own favourite entertainment programs such as games, a mini disco and theme parties. 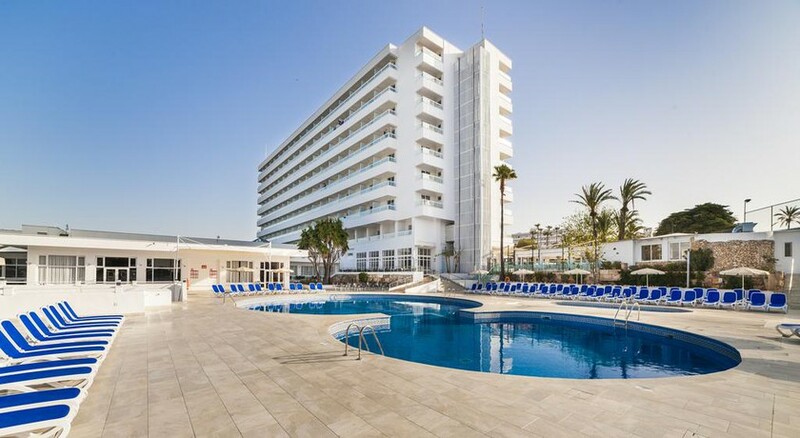 This family hotel is located on the resort of Calas de Mallorca, on the south-east coast of Mallorca. 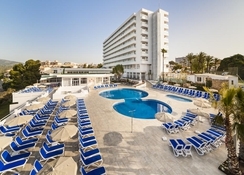 It is situated next to the tourist resort of Calas de Mallorca and Cala Domingos Beach. 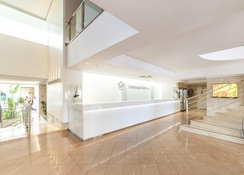 The Palma de Mallorca Airport is at a distance of 65 km from this hotel. The hotel is about 200 metres from the lovely beach of Cala Domingos. There are many shopping centres, restaurants, and other facilities near the hotel. The Playa de Palma beach is at a distance of 47 km from the hotel. The Hotel Globales Samoa offers 331 rooms all air-conditioned having a complete balcony or terrace which gives stunning views of the sea. Bathrooms have a combined shower/bathtub and are fully equipped with all the essentials. There are single suites and double suites designed to accommodate small and large groups. There is an option for non-smoking rooms as well. Facilities include cable TV, telephone, Wi-Fi, hire safe, and a hairdryer. Cribs and baby cots are available upon request. A daily room keeping service is provided. Rollaway beds also available upon request. The hotel’s buffet restaurant offers a variety of Mediterranean and International cuisines. It serves buffet breakfast, lunch, and dinner along with snacks, ice-cream, and locally produced drinks. They also have a children’s menu. Various bars are situated across the hotel, which serve cool refreshing drinks and tasty snacks to guests throughout the day. The hotel offers various fun and leisure activities. Guests can enjoy swimming in the pools, relax in the gardens, take part in different sports and watch entertainment programs. Kids can have lots of fun at their own mini club and playground. Sports facilities include tennis courts, multisport courts and table tennis. The peaceful and cosy beach of Cala Domingos is the perfect spot for relaxation. Guests can enjoy various beach activities like snorkelling, sunbathing, swimming and beach volleyball. Went on a cheap all inclusive holiday and it was lovely. Hotel staff were all very friendly and helpful and couldn’t do enough. The beach nearby was lovely and clean a very short walk from hotel. The shops opposite hotel are really cheap and great for browsing! We will definitely revisit!!!!!! This was a fantastic hotel. We stayed for a week in October half term. Food was varied and was a special children's menu if they didn't want the adults. The puddings were out of this world. Would definitely go again. The staff were very nice especially Laura who my children became friends with. Really good hotel nothing to say bad really would stay again. Was really lovely felt like the evening entertainment could of been improved but the food was amazing! The stay was very nice . My family and I had a great time . The beach also was close to the hotel. The staff friendly and supportive with any questions and queries. They will suply every day fresh washed towels and they will ask u if u need anything else. Although i loved the look and style of the hotel, when i go away i like some entertainment. Although is various exercise and cooking on during the day, much of the entertainment is primarily in French. Staff were friendly and helpful and for those less fluent in English they would try and meet the Spanglish half way. Night entertainment especially was in French, confused the youngsters and meant they got bored. Bars were good but was still charges even on all inclusive for certain drinks which was dissapointing. Room was great, toilets etc clean. Was not a fan of the glass doors on the toilets or the gaps between where people could watch you on the loo. The food was better then many of the hotels in the area have stayed in, in the past, but was the usual mix of the same sorts of food over and over. The difference being someone to cook fresh meat or fish in front of you though this was often slow and not cooked thoroughly. Snack bar also got repetitive with only so many pizza, burger or hot dogs to fill the gaps. For those with children too the pool is small even with the beech near.